I buy green beans wholesale (Sumatra Mandheling), which I roast in my Jiffy hot-air popcorn maker (Full City - just at second crack). I grind in my Breville BCG800XL burr grinder to very fine. Then I brew in my Krups Type 229 Aroma Control machine with the thermocouple in the basket which drips into an insulated carafe. I've been doing this for many years. Do I need professional help? I tried what they call coffee at the corner convenience store, but it tasted like cardboard. Does that make me a snob, or a connoisseur? Height above range for shelf? I concur with the comments above, you do not want gas fumes in your house. It can be difficult, particularly if you're range is on an inner wall, but it is very important that gas fumes be vented outside. When I converted to gas, I had a challenge finding a way to duct the hood, but my solution was to put the range at an angle in the corner, creating space behind to go down and out under the floor. It also provided an opportunity for additional cabinets and shelving. I considered the Technivorm and Bonavita. They have the strength of good temperature control What they don't have, which the KRUPS does, is a thermocouple which allows the grounds to bloom properly before passing the brew to the carafe. While the temperature isn't adjustable on the KRUPS, my instant read shows 198ºF, which is what I would choose. I see that OXO has a new machine similar to the Bonavita and Technivorm, but which might also do a good job of temperature control and blooming cycles. I haven't seen any reviews, however. The Londinium looks awesome! I haven't seen that machine before. I have a 90 year old house. When I bought it, the kitchen was a 1965 remodel. It was broken and dysfunctional, but the light bulb .... yes, one light bulb ... worked well. I did almost all the work myself, from design to finding appliances to designing and commissioning cabinets to making the counters. The marmolium floors are awesome. The PaperStone counters are temperature tolerant to 380ºF and feel like soapstone, but I was able to cut them with woodworking tools. Before ... yes, that's a Litton MicroRange ... Ugh! But a couple months and few dollars later, I have a place I love working in. Lots of new outlets. Massive counter space. What isn't shown is the mobile cutting board I built on top of an old French baker's table, which normally sits between the fridge and the sink. Of course, the counters are full of stuff now: coffee roaster, bean grinder, drip brewer, sous vide, knife block, ... the usuals. Multiple responses ... The vent hood is a GE Profile ... 400 cfm. The cabinets above the sink and the long counter are the original 1925 boxes. They're solid and I couldn't justify the $10-15,000 to replace 18 feet of cabinets. I did put LED tape lights under the old cabinets, which provides great lighting for the entire counter. Over the sink I hung a couple pendulum lights. Over the stove I custom built the open shelves to join the closed cabinets. Somehow, they turned out just the right size for wine bottles! Here's the finished backsplash. The iridescent tiles don't really show very well, but it's better than nothing. With a gas stove, I wanted ventilation, but I didn't have the option of going up and out through the ceiling. Instead, I was able to go down in the cantilevered wall behind the stove, then laterally outside (to the right). The key was finding a vent hood fan strong enough to draw, but not so strong that it would put out the pilot light in my furnace. Here's my French Bakery table in the center of the room, but before I'd finished the backsplash. It forms the perfect triangle between stove, sink and refrigerator ... with workspace in the middle. The whole project, showing progress details. It's called PaperStone. It's a green product made from recycled newspaper and cashew ester. It's stable and cool to touch. It comes in a bunch of colors. I've seen some really creative applications such as a drain board routed into the surface. I'm not sure where it's available. I bought mine from the factory in Hoquiam Washington. What's Happened to Canned Tuna? For whatever reasons, canned tuna quality has deteriorated. Here, in Oregon, we have the blessing of a run of albacore that pass up the pacific coast each summer. These fish are 15 to 25 pounds and readily take a lure. The taste of these fish raw is sublime. However, the shelf life of fresh tuna isn't very long. Since we typically catch dozens at a time, we have to find ways of preserving it. The favorite among my friends is pressure canning. Typically in wide-mouth pint jars, we put up cases of tuna in marathon canning sessions. The flavor of fresh canned tuna is amazing. It lead me to ask how the commercials do it. The normal commercial method is to steam or boil the tuna before putting it in the can. That means the flavor has been rinsed from the fish before canning. Yuck. Home canning involves putting fresh, raw fish in the jar with a little oil, a micro-pinch of salt, sometimes some other flavors like jalapeno or lemon rind. After having home canned tuna and understanding the commercial canning process, I have give up on "cat food" forever! There are specialty canners who don't sterilize the fish before commercial canning ... seek those and avoid the big industrial canners. fisherPete replied to a topic in Welcome Our New Members! Thanks! My gvt job is completely unrelated to food. The most uncreative thing imaginable - auditing. Fishing and foraging are all about time and place ... most fish are migratory, most fungi are seasonal ... time and location, then technique. fisherPete posted a topic in Welcome Our New Members! Good morning, new friends! I'm a Pacific Northwesterner by choice. I moved here in '74 to be near the year-round fishing and hiking. 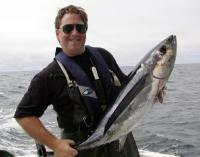 I continue to enjoy catching, preparing and serving chinook, coho, dungeness, ling, tuna and other finny critters. I also enjoy foraging for chanterelles and morels. I have a large vegetable garden to supplement my kitchen. I do government work for a living, but the living I work for is largely food focused. In addition to my own kitchen, I am surrounded by amazing restaurants, micro distilleries, micro breweries, bakeries, cart pods and a community of creative culinary minds. I love playing with my food! I'm here to learn new things or better ways to play.